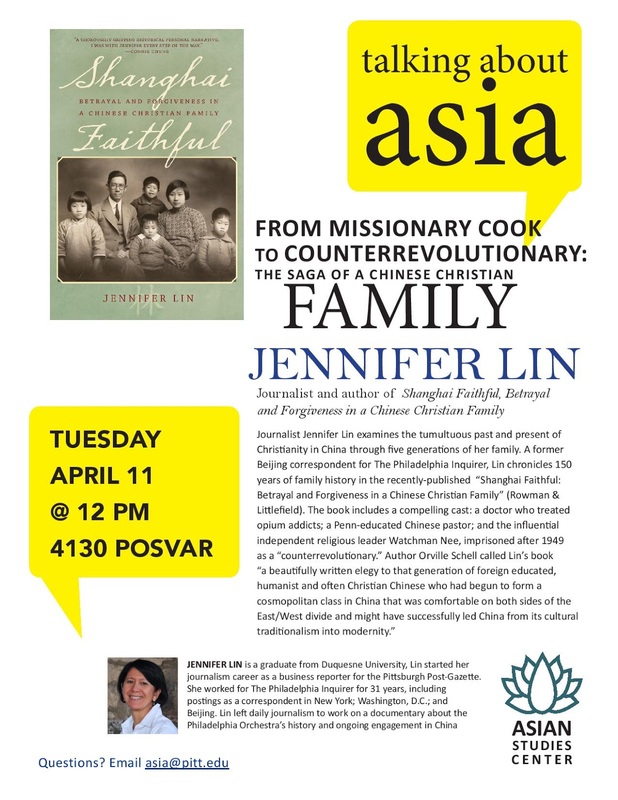 PennsylvAsia: Jennifer Lin and "From Missionary Cook to Counterrevolutionary: The Saga of a Chinese Christian Family" at Pitt, April 11. Jennifer Lin and "From Missionary Cook to Counterrevolutionary: The Saga of a Chinese Christian Family" at Pitt, April 11. The University of Pittsburgh's Asian Studies Center will host journalist and author Jennifer Lin and her talk "From Missionary Cook to Counterrevolutionary: The Saga of a Chinese Christian Family" on April 11. Journalist Jennifer Lin examines the tumultuous past and present of Christianity in China through five generations of her family. A former Beijing correspondent for The Philadelphia Inquirer, Lin chronicles 150 years of family history in the recently-published "Shanghai Faithful: Betrayal and Forgiveness in a Chinese Christian Family" (Rowman & Littlefield). The book includes a compelling cast: a doctor who treated opium addicts; a Penn-educated Chinese pastor; and the influential independent religious leader Watchman Nee, imprisoned after 1949 as a "counterrevolutionary". Author Orville Schell called Lin's book "a beautifully written elegy to that generation of foreign educated, humanist and often Christian Chinese who had begun to form a cosmopolitan class in China that was comfortable on both sides of the East/West divide and might have successfully led China rom its cultural traditionalism into modernity." See also the April 3 book review and profile in the Pittsburgh Post-Gazette. Lin will also speak at Duquesne University on the 10th and will give a reading at St. Vincent's College the evening of Tuesday the 11th. The talk begins at 12:00 pm in 4130 Posvar Hall (map) and is free and open to the public.